Today…Pam Bachorz, author of CANDOR! 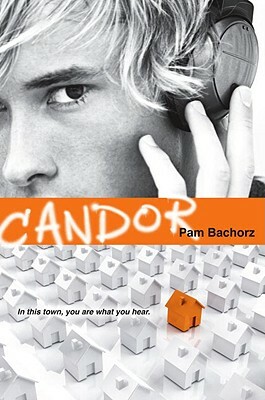 I was lucky enough to read an advance reader copy of CANDOR (Egmont, 2009), a powerful YA novel about a "perfect town" where everything is far from perfect under the surface. Candor’s "messages" program teenagers to behave perfectly, but what happens when one stops listening? What happens when a new message gets out there? It’s a fantastic dystopian novel — one that would make a great discussion choice for book clubs and literature circles. And without giving out any spoilers, I have to say that the ending of this book absolutely blew me away. I’m pleased to welcome Pam to the blog today for an interview! Welcome! What books did you love when you were a kid? My mother and I shared the LM Mongtomery books together–Anne, Emily, Pat, Marigold, all of them. As I grew older, I fell in love with the Sunfire Romance series, and then Lois Duncan and all the other authors writing "creepy" YA at the time (Mildred Ames, anybody?). I was so lucky to have a number of teacher and librarian mentors in my life, and I thank a number of them in my CANDOR acknowledgments. In particular, my middle-school English teacher, Emily Adams, convinced me that I had talent–and that I still would have to write draft after draft before my stuff was good enough for publication. She died a number of years ago, and I’m so sad that I can’t send her a copy of CANDOR. I make a schedule every week for my writing, and post it on my study door. I also make goals for that time, such as writing 20 pages, outlining a third of the book, whatever. I do play a lot of music while I write, though sometimes I need total silence. I keep See’s hard chocolate lollipops and decaf green tea close at hand! I love Holly Lisle’s One-Pass Revision method. Print your manuscript out and rip it to shreds with a pen–then enter it all in a computer. It stops me from the endless, addictive cycles of stopping in the middle of a manuscript and going back. Love your first drafts while you write them–but after that’s done, spend a ton of energy and time on making them better. Lots of writers, whether young or old, make the mistake of thinking their first effort on a story is brilliant. It never is! CANDOR was inspired by the 6 years I spent living in a planned community in Florida. It’s filled with settings that were inspired by the town, and I tried hard to capture the feeling of living in a place like that. A friend found my agent for me–she had posted on the Blue Boards that she was a new agent and was looking for people who had written smart YA fiction with a boy’s voice. But I hadn’t been checking the BB so I’m glad my friend was! My agent, thankfully, did the job of finding me my wonderful editor. Thanks for joining us, Pam! You can read more about Pam at her website (Check out the fabulous trailer for CANDOR while you’re there!) You can pick up your copy of CANDOR at your local independent bookseller, order it through one of my favorite indies, Flying Pig Bookstore (they ship! ), or find an indie near you by checking out IndieBound! This entry was posted in Uncategorized and tagged candor, pam bachorz. Bookmark the permalink. Both comments and trackbacks are currently closed.